Your garage door makes a statement, and when it comes to choosing the right one for your home or business, there are thousands of color, design, and function options to consider. Our garage door specialists will work with your unique needs, to pick and install the perfect door – whether that be wood, steel or aluminum. Sound Door Service has access to great bargains and styles to suit any taste. More importantly, we have over 15 years of experience repairing and installing garage doors all around the Seattle area. Contact our experts for new garage door installation in the Bellevue, Sammamish, Redmond & Mercer Island, and ask about top brands like Northwest Door, Wayne Dalton & Amarr! You can rest assured that your new garage door will be installed promptly and correctly. We are also bonded and insured. The traditional Steel Door is a strong steel sectional overhead garage door. The deep-rib design, accentuated with a wood grain texture produces a door of superior strength while enhancing the street appeal of your home. Steel doors are highly durable and can withstand harsh weather conditions. These doors can be purchased both insulated and non-insulated where the insulated doors can have positive effect on the overall heating or cooling of your home. They are available in a variety of colors and styles to further accent your home. 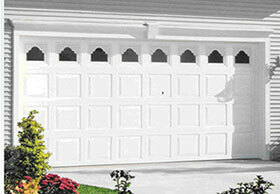 Now you can have the stylish appeal of a sleek and architecturally refined garage door, with an Aluminum Garage Door. This Modern Classic Door is a true stile and rail garage door made with an all-aluminum construction. Panel widths and heights can be configured to meet your requirements. Choose from glass or aluminum panels, painted or anodized finish, regardless of your choices this beauty will last a lifetime and is virtually maintenance free. If your home requires a wood door, your choices are practically endless. Carriage house & Heritage Classic by Northwest are becoming a favorite with homeowners who want to give their home old-world charm with the conveniences of today’s roll-up doors.